Turns out there’s nothing like a week of eating only tapas to get me in the mood for a hearty single-course meal. The weather in Catalonia turned cold at the end of our trip too, which only intensified my cravings for rich, warm comfort food. Tucking into a bowl of something so decadent that it would surely live on my thighs for months to come was all I could think about as we made our way home. I scrolled through photos in the security line and scoured recipes on the plane while visions of slow-cooked meats thrummed through my thoughts, “should we have brisket? Or maybe soup...wait, what about pork ragu? No, more like bolognese, or even better, a classic beef stew.” Yes! That’s the one. I’m not even going to try to convince you that this beef stew is worth making - though I hope it goes without saying that it most certainly is - because the one thing you absolutely cannot miss here are the Cheddar Herb Dumplings. A proper noun, these dumplings. They were a revelation for me. Savory morsels with a delicate exterior texture that holds together surprisingly well, but when sliced with the side of a spoon gives way to a luxurious interior of herb-kissed molten cheese. I’ve honestly never met a better conduit for beef stew juices in my whole life. And as if I couldn’t brag on them for anything else, they are dead simple. Which makes sense considering the recipe comes from What to Cook and How to Cook It, by Jane Hornby, whose cooking style I have long admired for being unabashed and unapologetic in it’s refusal to be fussy. Her recipes revel in the powerful simplicity of a straightforward technique applied to a short ingredient list, and this beef stew with Cheddar Herb Dumplings is no exception. This is one for the files, weekend cooking at it’s finest. Prepare the beef. Mix the ¼ cup of flour, 1/2 tsp salt, and a few turns of a pepper grinder in a plastic bag, then add the beef. Shake vigorously to coat the beef in the flour. Place a large dutch oven (or other heavy-bottomed, oven-proof pot) over medium heat. Add 1 tbsp of the olive oil to the pan and allow it to heat up. Put half of the beef into the pan, tapping away the excess flour from each piece before it goes in. Brown beef very well until there is a nice crust on all sides. Transfer the browned beef to a bowl, and repeat these steps with the next batch. It should take about 10-15 minutes per batch, but as Teri from No Crumbs Left says “and guess what? This part takes as long as it takes.” When the second batch is well browned on all sides, remove it to the plate. Prepare the vegetables. Melt the tbsp of butter in the pan and let it foam up. Once the foam has gone down add the sliced mushrooms and saute until they release liquid and it evaporates. They should be nicely browned around the edges, about 8 minutes. Add the splash of vinegar and scrape up any browned bits still left on the bottom of the pan. Let the vinegar cook down, about 2 minutes. Remove mushrooms to the plate with the beef. Add the last tablespoon of olive oil to the pan and allow it to heat up a bit. Then add the onion, carrot, thyme sprigs (either pluck the leaves or add the whole sprig and remove the stems later), and bay leaf, if using. Saute until the onions are turning golden, about 10 minutes. Stir in the tomato paste and cook for a couple minutes longer. 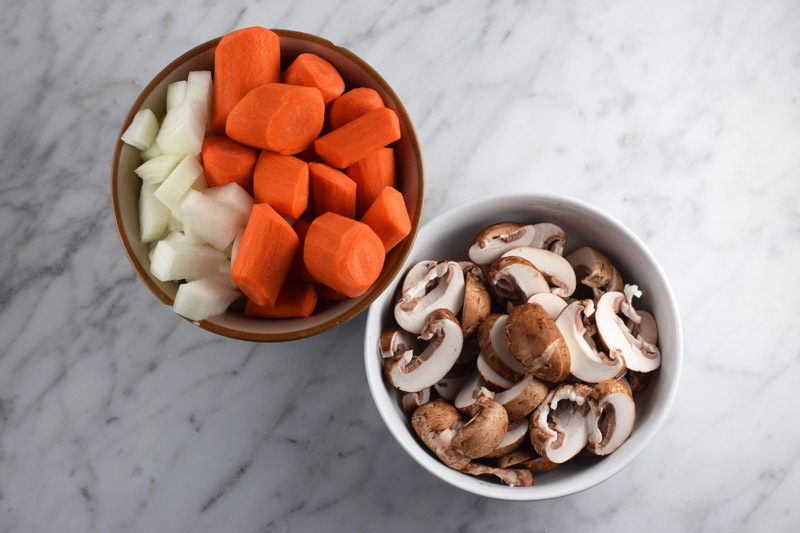 Return the beef and mushrooms to the pot, along with any juices that accumulated on the plate. Pour in the red wine and 2 cups of the broth. The top pieces of meat should just barely be poking out of the liquid (see the photo directly above the one of dumpling prep). Add more broth, wine, or water here to bring the liquid to this level. Note: I added another full cup of broth at this point and have adjusted the amount of broth in the recipe to reflect this. Bring the pot to a simmer over low heat, and once bubbling, cover with a lid and transfer to the oven for 2 hours. About 10 minutes out from the 2 hour mark, start preparing the dumplings. Mix the flour and baking powder in a medium bowl. Cut the cold butter into the flour and mix it using your hands. Continue mixing until it’s crumbly throughout and all butter chunks are the size of a pea or smaller. Pause on the dumplings, and check the stew. The meat should be tender enough to cut easily with a spoon. If it’s not ready, give it an extra 30 minutes. Once it is ready, remove the pot from the oven and spoon off any excess fat from the top; Taste a small sip of the gravy - careful not to burn your mouth! - and season with salt and pepper as needed. Using two forks, shred the meat into bite-sized pieces. If the liquid looks a bit low, add more broth here. Note: My total broth used during cooking measured to 3 ¾ cups. Return to the dumplings. Stir the milk, thyme leaves, and cheese into the butter-flour mixture. Add a big pinch of salt and a few turns of a pepper grinder. Divide into 12 segments and shape into balls. Set the dumplings on top of the stew, and return the pan to the oven, uncovered, for 30 minutes. The stew is ready once the dumplings have swelled and turned slightly golden, and the gravy is rich and brown. Enjoy! Reheating Tips: Remove the dumplings from the pot and reheat the stew on the stovetop over low heat, adding more broth or water as needed. (I added a ¼ cup.) Meanwhile, toast the dumplings separately in a 350 degree oven. Combine and dig into the best damn leftovers you’ve had in ages! Hello hello everyone and welcome back to the Umami for Days show, where you can always count on me to prattle for at least 3 paragraphs about the niceties of my daily life before prattling some more to tell you all about what I’ve been noshing on lately. Today’s we're talking about the mighty and mysterious Moussaka! Moussaka is an elusive character in terms of origin with multicultural roots spanning Greece, the Balkans, the Levant, and the Middle East. A friend from Lebanon tells me she grew up knowing it as originating from Greece, and so much googling on my part turned up nothing conclusive enough to mention here. But while one can’t be certain on where moussaka was dreamed up, nobody would doubt that it’s dreamy! [A veritable language playground just brimming with important food facts, this blog!] If I had to describe this hearty three-layer casserole in just two words they would be "so meaty.” But with a couple more I'd describe it as fragrant with spices, rich with tomato sauce, made lush by a layer of custardy béchamel. A quick image search might give you the impression that this moussaka will serve up in perfect little squares almost like a lemon bar, and yours very well might if you make a point of aiming for such a results by using a square pan, waiting for the dish to cool to room temperature after baking, and focusing on precise slicing and serving. We, on the other hand, scooped up our helpings as soon as possible (i.e., after a 15 minute rest out of the oven), allowing them to tumble into messy piles of spicy, meaty goodness on our dinner plates, and we don’t regret a thing. This recipe, while not requiring any heavy lifting in terms of technique, does entail quite a few steps that cannot be abbreviated (in my experience, at least). I wouldn’t say that it requires a lot of effort, but it certainly takes a good bit of time, as you have to prepare all of the components for the three layers (meat, eggplant, béchamel) separately before you assemble and then bake for almost an hour, with a 15 minute rest prior to eating. But ohhh sweet nuthin', what can I even say? The time you’ll spend is worth it, worth it, worth it. The finished product is both grand and homey, all at once. We’ve made it three times in as many months, and are now on a bit of a Moussaka kick. I’m eyeing this recipe for the next go round because a base layer of potatoes does sound like it would do so well here, especially considering our household consensus of veg > meat. You know you’ll be hearing all about it when I do. Cheers and happy cooking! Meat: The original recipe called for 1 lb of lamb and 1 lb of beef, but we aren’t big fans of ground lamb (i.e., I tolerate it in the name of trying new recipes, but Cos doesn’t like it at all.) I used all beef for every iteration. Portions: The first time I made this I used a short 2 lbs of ground beef and made the full recipe; this made for faaaar too many leftovers for us and I got some intense indigestion trying to take them down on my own over a week of lunches. 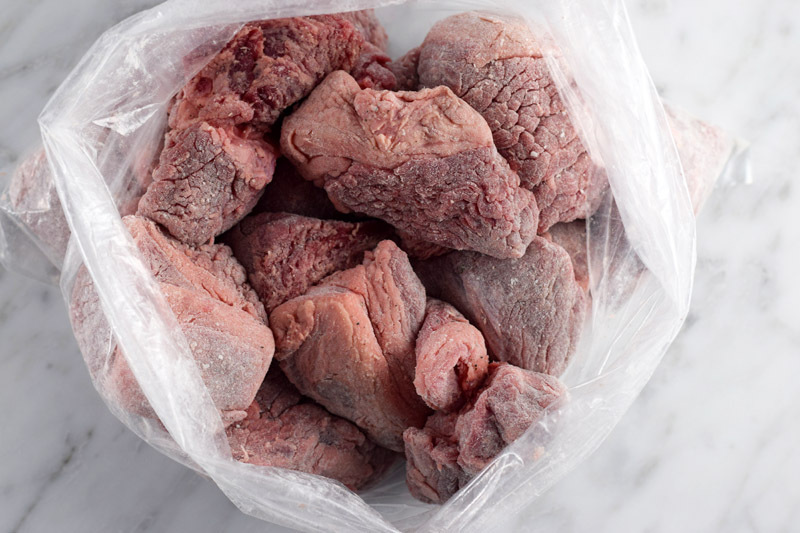 (#SmellsFromTheCubicle) The second time, I halved the recipe so only needed 1 lb of beef, and it worked well. 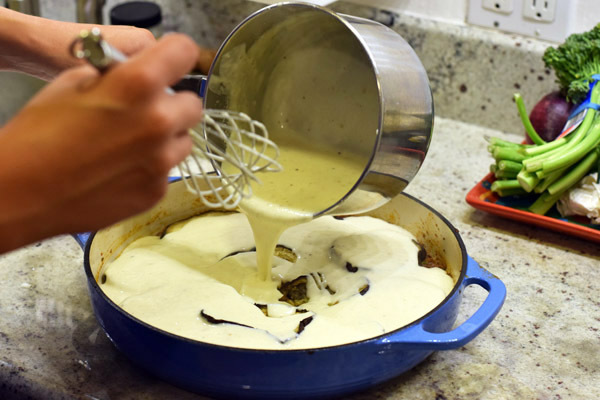 Most recently, I tried making the full recipe with only 1 lb of beef, and while all the flavors still nailed our expectations, the béchamel way overwhelmed the meat. If you, like us, know that 2 lbs of meat will yield too many servings for you and yours, just go ahead and halve the recipe and cook it in an 8x8-ish pan or small dutch oven. Custardy Béchamel: We are a house divided on the texture of custard, and Cos is on the “ehh” side of the fence. The first two times, I told him (nicely) to get over it and eat his supper. The third time I relented (I aim to please here, guys) and used only 1 egg in the béchamel, boiling it down a bit more on the stove so that it would set up solidly without the second egg. Keep this in mind if you’re like Cos and don’t care much for the texture of custard. Cloves: I’m not a fan of the flavor this spice imparts, and only ever use it begrudgingly in my single, annual pumpkin pie. I left it out here and did not miss it, plenty of spice otherwise. Prepare the eggplant. Grease one large baking sheet (or two if necessary) with a thin coating of olive oil. Place the sliced eggplant on the pan in a single layer, then brush lightly with more olive oil. Season with salt and pepper, and bake until golden and pliable, about 30 minutes. Set the eggplant aside, but leave the oven on. Prepare the meat filling. In a large Dutch oven or heavy pot with a lid, heat 2 tablespoons of olive oil over medium-high heat. Add the ground meat(s) and cook, breaking it up with a spoon, until it is browned and most of the liquid has evaporated, about 10 to 15 minutes. Add the diced onion and cook, stirring intermittently, until the onion is translucent, about 5 more minutes. Stir in the garlic and cook for 2 more minutes. Turn the heat down to medium and splash in the red wine vinegar, scraping up any brown bits stuck to the bottom of the pan. Cook until the vinegar has mostly evaporated. Gather up a third of the roasted eggplant and chop or tear into small pieces. Add them to the meat mixture. Stir in the cinnamon, allspice, nutmeg, coriander, thyme, oregano, and cloves (if using), and cook until fragrant, less than a minute. Season with salt and pepper. Scoot the meat over towards one side of the pan to make a bit of clear space at the bottom of the pan and add the tomato paste, smearing and scraping the paste across the hot surface so that it cooks and darkens, 1 to 2 minutes. Incorporate the paste into the meat mixture, then add the tomatoes and water and bring to a boil. Once the mixture is boiling, reduce to a simmer and cover. Let it bubble away, stirring now and again, until the béchamel is ready. Add a little more water if it starts to get too dry, a tablespoon or so at a time. Make the béchamel. Warm up the milk in a glass measuring cup in the microwave (I did for 2-3 minutes), or in a pot on the stove. [Note: I’m willing to bet that you could skip this step altogether, especially if you measure out the milk and leave it out on the counter when you preheat the oven so that it’s no longer ice cold. Though I haven’t tested this theory, I don’t usually pre-warm my milk when making béchamel otherwise. I just happened to here in the spirit of following directions well.] Either way, it should be just under boiling (if you choose to heat it). Melt the butter in a heavy-bottomed sauce pan over medium heat. Once fully melted, whisk in the flour and cook, stirring constantly, until it has picked up a little bit of color, about 3 minutes. Slowly pour in the milk, whisking all the while. Continue to cook, stirring, until the mixture comes to a boil and thickens. If you plan to only use one egg (see note above), boil it it down a little more now. Stir in grated cheese and nutmeg, then taste and season with salt and pepper. Set the béchamel aside for a few minutes. Assemble the dish. Check the meat for seasoning. [Note: Tara says here, “it may need a surprising amount.” I found that it did need a surprising amount every time.] Stir in the chopped parsley. Assemble the moussaka directly in the Dutch oven, or in a 9x13 inch baking dish. Layer the roasted eggplant slices on top of the meat mixture. Temper the egg(s) by stirring in some of the warm béchamel, then stir the egg mixture back into the rest of the sauce. Pour this over the eggplant and meat. Bake until the edges are bubbling and the top is well browned, 40-45 minutes. Let stand for 15 minutes, then serve with a simple salad or (if you’re like us) a pile of roasted vegetables. This poutine was the highlight of my day yesterday. I worked from home, which per the usual, turned me into a mole person who remains glued to the couch avoiding the sun for the entire day. Around 5:30 pm I finally pried myself away from the hazy blue glow of the laptop and shut it down like Liz Lemon would do. I popped a Terra chocolate-covered espresso bean (because: California) on my way out the door, and headed out for a stroll around the 'hood. It's worth mentioning at this point that I live in a neighborhood of San Francisco that is not my favorite. What I mean is, when it comes to having feelings about our neighborhood, I'm a solid meh. That's not to say that it isn't a pretty sweet spot, though, because it definitely is with its all it’s lil nouveau chic places to wine and dine, shop, and get jacked up on good coffee. There's even a semi-permanent piece of structural art in the tiny retro-fitted strip park where we walk our kitten, Mo (oh yes, we do, we fly our freak flag high). It's just that everything in and around our little valley is so damn fancy. And the folks that visit regularly are really fancy too. Large concentrations of fancy makes me sort of nervous, though it does make for excellent people-watching material. So yesterday, while strolling and fancy people watching, I was thinking about what to make for dinner. Eventually, I ended up at my local butcher, Fatted Calf, which let me just say, is exactly the kind of fancy I can get down with. The folks at Fatted Calf do their thing so well and often end up convincing me to try something new when I come in with all my meat-related questions (girl's gotta learn about all those different beef cuts somehow). This day was no exception to say the least, and don't know if it was the coffee bean or what (it probably was), but when I saw oxtail sitting front and center in the display case, I just had to go for it. I had seen this video a while back and it stuck with me because fries are everything to me; they're my desert island food. Cheese fries are even more special, if that's possible. Fries with gravy and cheese send me to another dimension. "Yeah, let's go with the oxtail," I heard myself say. I'll admit, this was an aggressive recipe for a weeknight (which was my coworker's exact response to my picture of it, ha! ), but the decadence of it all was so completely worth the time spent. The final product is restaurant quality in all the right ways, most noticeably so in the liberal use of heavy cream. Practically speaking, this dish would work well as a dinner party appetizer, but I ate mine with leftover roasted Brussels sprouts on the side while watching the season finale of Bob's Burgers with my main squeeze. It was sort of ridiculous, it was sort of amazing. It was Wednesday night adulting with flare. I scaled the recipe way down from the amount that the Bon Appètempt version calls for because I knew we would only eat it once, so leftovers were out. Plan to cook the fries as close to serving as possible. Trust me on this one, if only because I followed this rule and it worked out perfectly. That extra little crisp in the fries helps them hold up well under the blanket of gravy, woven through with silky onions, that you will heap on top of them. In the interest of recipe testing (heh) I ate a handful of cold fries as a desk snack today and it reminded me again of how much more I love them fresh out of the oven. I deviated slightly from the temperature and cook time recommendations, cooking my oxtail for only 1 hour. In the interest of bringing the gravy and fries together with good timing, I turned the oven temperature up once the meat had cooked for roughly 40 mins. The fries needed to cook at 450 and had already been boiled, so I was wary of letting them sit too long before roasting. I took the meat out when the temperature got closer to 400, which brought the cook time to almost exactly an hour. It worked out just fine, but I had to boil the gravy on the stove for longer to get it thick enough. Recipes for cooking tougher meat like tail generally call for a longer cooking time at a lower temperature. I reflected that below. I used this recipe for the first time, and it was perfect as printed. Heat up the olive oil in a large dutch oven or other heavy pot. Pat the meat dry and sprinkle salt and pepper on all sides. Once the pan is hot and the oil is shimmering, lower the meat into the pan and brown it on all sides. Meanwhile, slice the onion into very thin half moons. Once the oxtail is nicely browned on all sides, remove it to a plate and add the onions to the pot. Sauté the onions until they are slightly golden. Tuck the meat back under the onions and add the bay leaves and the wine. Lay a piece of oiled parchment paper over the meat and onions, then cover with a lid. Bake for one and a half hours, checking at least at the halfway point to make sure that it doesn’t get dry. Add more liquid if you need to. I added about a half cup of water at the halfway point. Remove from the oven. Lift the lid and remove the meat to a plate. Stir the cream and mustard into the reduced wine and check the seasoning. Bring to a boil until it thickens to your liking. You can add the gravy directly on top of the fries and top that with cheese, or melt the cheese on the fries first and add the gravy on top like we did. I already had some chives on hand so I chopped those up as garnish. Green onions would have also been nice.